9/29/2008Share this story on Facebook! Riders taking off from Stewart Park at 6:30 a.m.
See Fuse photo editor Jeffrey Goodwin's complete gallery of Ride for Life images. In 1999 Ithaca grad Jerry Dietz, along with friend Russ Traunstein, organized the first annual AIDS Ride for Life. 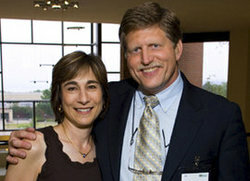 Since then, Jerry and Judy Shapiro Dietz have raised millions to fight AIDS and hunger. Read more in IC View, Ithaca's magazine for alumni, parents of current students, employees, retirees, friends, peers, and neighbors of the College. 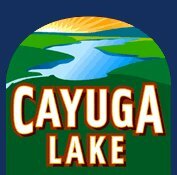 The AIDS Ride for Life follows the Cayuga Lake Scenic Byway, one of the most beatiful routes in central New York. Find out how you can be part of next year's AIDS Ride for Life. What More Can You Do to Help? Ithaca College strongly encourages all students to become involved in community service. The College's Center for Student Leadership and Involvement acts as a clearinghouse for volunteer opportunities on campus and throughout the community. Hundreds of headlights pierced the pre-dawn darkness as cars made their way down the hilly Ithaca roads toward Stewart Park. The park was filled with riders -- including many from the Ithaca College students, staff, and faculty -- poised to take part in the Southern Tier AIDS Program's (STAP's) tenth annual AIDS Ride for Life. 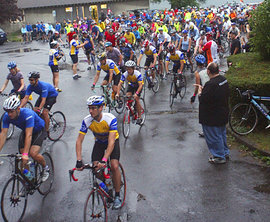 The hundred-mile AIDS Ride is a capstone event for the Southern Tier AIDS Program. It's a single day of celebration as well as a display of gratitude to the volunteers who put in four months of fundraising and awareness efforts for STAP. This year, 380 riders raised $260,000. The money will enable STAP to continue to be a resource to community members living with HIV/AIDS. A sea of excited volunteers and riders assembled for the opening ceremony at 6:00 a.m. with helmets, shorts, and water bottles in tow. Air America radio host Rachael Maddow spoke words of encouragement to prepare the group for a day of fun, sweat, and maybe a few tears. During a moment of reflection, STAP administrators wheeled out the "riderless bike" in memory of those not present at the ride. At the end of the ceremony the riders were set loose on the street for a scenic ride around Cayuga Lake. 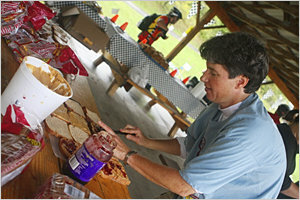 IC staff member Vanessa Brown makes sandwiches at the peanut butter and jelly station at the King Ferry Winery. Along the route, riders were encouraged by cheering spectators, cars full of volunteers driving along side of them and playing music, and a host of road signs in support of the ride. Volunteers also cruised the route to help with the occasional flat tire and to ensure the general safety of the riders. There were rest stops every twenty miles where riders had the opportunity to refuel with Gatorade®, juices, and other snacks. These stops also gave riders a chance to talk with one another and check-up on teammates. The halfway point of the ride was in Seneca Falls. For riders whose goal was the 50-mile mark, the historic city was the end of the line. For those who were riding 85 or 100 miles, it was another replenishing site; riders could enjoy a massage or some of the soup, sandwiches, cookies, and fruit provided by local businesses. Steve and Chris Zinder (at left) check on their son Adam as he takes a break from riding to grab some ice cream and chat with fellow rider and IC associate professor of writing Jerry Mirskin. The riders completed the 100-mile ride in Ithaca's Cass Park. The fatigued and triumphant riders were greeted with cheers as they crossed the balloon-covered finish line. During the reception each rider received a medal to mark the occasion. In Cass Park there were more massages along with music, crafts, and other festivities to complete the day-long celebration of life. At 5:00 p.m. all of the riders lined up one last time for the three-mile victory ride through town to Stewart Park where the ride had begun so many hours ago. They mounted their bikes with pride and pain and took off, escorted by the Ithaca Police Department. The streets of Ithaca filled with cheers for the riders and their cause. The day concluded with a dinner for all involved. Members of the Ithaca class of 2009 congratulate the riders as they make their final turn. Some people rode for the physical challenge and others rode in memory of a loved one, but everyone rode to support the fight against HIV/AIDS and to celebrate a "decade of positive pedaling"!